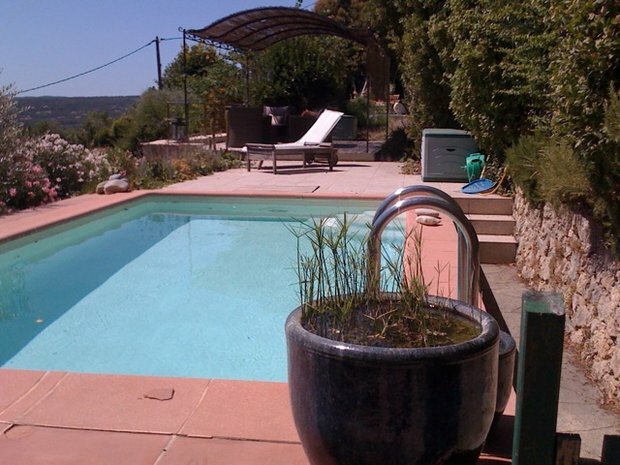 Holiday Villa to Rent in Callian, Provence, France. Before I moved to the Isle of Man with my family, we lived in a village called Callian in the south of France. We still have our villa in Callian, and now we’re renting it out to people who want a holiday in this delightful part of France. Just 30 minutes from the coast at Cannes or Frejus, our villa in Callian is a great base from where to explore the area between the Mediterranean coast and the foothills of the Alps. Nearby villages like Fayence and St Cezaire have wonderful farmers’ markets. Lake St Cassien – just 10 minutes away – is very popular with children in the summer. And the perfumeries of Grasse are less than 30 minutes away. Plus there is gorgeous scenery and a huge range of village restaurants in this entire ‘Pays de Fayence’ area of the Var. Of course, you can just stay at our villa and have a relaxing time. It’s five minutes walk from the village shops in Callian. The secluded garden has a pool. And the house itself has three bedrooms, air conditioning and wifi. You can find out more about our Callian holiday villa at www.letouareg.im. Or email nigel.watson@luviair.com to enquire about making a reservation.